I've done some of these articles from books (like The End of the Affair and Starship Troopers) and other movies (like Citizen Kane, City Lights, Raiders of the Lost Ark, and Butch Cassidy and the Sundance Kid), but now it's time to take a look at a scene from The Third Man. It blends the best of Orson Welles (as he's in the film and drives this scene) and Graham Greene, who wrote this particular screenplay. 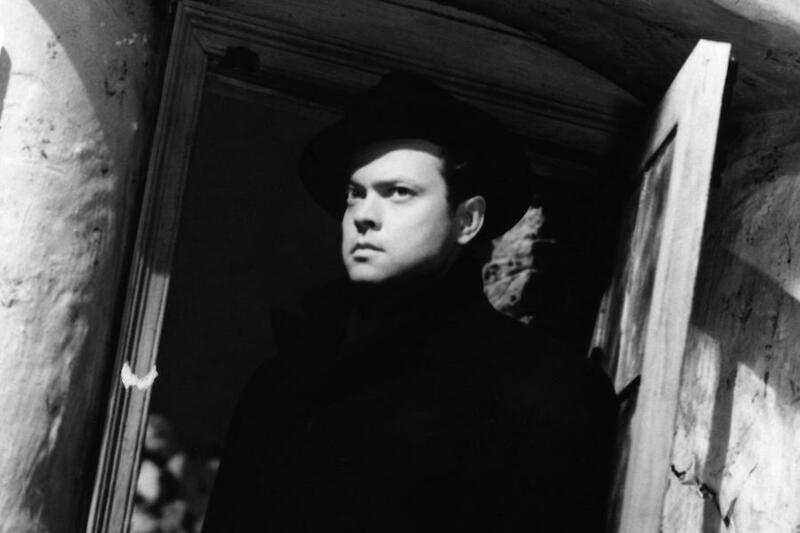 The Third Man is a tale of the black market in Vienna, just after World War II. It's about a cheap, dime-store Western novelist named Holly Martins (played by Joseph Cotton) and his friend Harry Lime (Orson Welles.) Lime offered Martins a job in Vienna, so Martins leaves America and arrives, only to find that Harry Lime is dead. Penniless, without a friend or reason to be in the country, he gets involved in the police (largely the British police, Vienna in this time is divided into four zones controlled by different countries), and investigates the murder of his friend. Until Lime shows up alive. And he's wanted by the police (which is why he faked his death in the first place.) Martins gives chase but isn't able to catch Lime before he fades away into the Vienna underground at night. But finally, they make contact and agree to a meeting. And they step aboard a Ferris wheel. Let's start with the setting. We're on a Ferris wheel. It's high up and the shots are designed to give us a sense of dizziness. It's to put us off balance as much as it was a choice of Harry Lime's to put Holly Martins off balance. This is something you need to pay attention to when you're choosing settings for your scenes. How can the setting help add tension or interest to a scene? In this case, we're being told a lot about the relationship between these two men based on the setting. And we're taught a lot about their philosophy in a way that's aided by the height. Granted, this clip comes in a few lines into the scene (it was the only one I could find on YouTube), but it begins with the two of them being friendly. But the scene takes a turn when Martins tells Lime that he knows what happened. That he had passed bad penecilin off to the black market and many people died because of it. That's what brings Lime to open the door of the Ferris wheel. This is supposed to have an air of menace to it. Lime's speech about the "dots down there" really reinforces where his moral compass is at. He's taking a literal 300-foot view of the people whose lives he might destroy because they're not people. When they're people, it's much more real for him. But the setting is working with us to help tell that story. Martins is shocked that his old friend would think such a way. We can see it in his face. And he responds by threatening jail for his old friend. There's a philosophical battle going on here. Lime seems confident though and fires back with the idea that the jail is in another zone. The cops that are interested in him are from a different country, for all intents and purposes they ARE a different country. But the only proof is his friend. The pauses of breath and stares here build tension. "There's no proof except you..."
And we're shown Martin's reaction. He looks down, we know that he's looking down to consider the ground hundreds of feet below. We can imagine him being pushed right out of the window and falling to the ground, without having to see the ground again. The situation and tension has been set up with the setting that we don't need to waste time reminding the audience of that eventuality. It's doubly reinforced when Martins wraps his arm around the window, bracing himself. Martins, being a writer, knows where things are heading. "I should be pretty easy to get rid of." Then Lime doubles down with a sadistic charm. "Pretty easy." With nothing left to lose, Martins offers one more card of information. Lime faked his own death, but someone was in the coffin they buried. Someone else had been murdered and that's who they found. These are new charges he'll be responsible for. It's one more layer to the scene where we discover so much just with the sparest hints of dialogue. Then Lime turns again, trying to defray the tension. He closes the door, ending the death threats. He needs Martins now, he's the only one who might be able to help him get out of that particular situation, so his needs have changed with his demeanor. Now he's trying to convince Martins to join his side. First, he appeals to his friendship. Then logic. But then Martins brings it to morality and religion with just six cutting words. "You used to believe in God." Pay attention to how much is being said in the dialogue with so little actually being spoken. How much of the situation is apparent even though we're not having every single situation or feeling narrated for us. This is the brilliance of this scene. That's where the tension arrives. Then we're treated to some of the most interesting cognitive dissonances in Lime's character. He is justifying his callous murder streak by saying that the dead are happier dead while at the same time he's writing the name of Anna, the woman he left to fake his death and has been central to the story, in a bit of grime on the window. He does have a weakness, a soft spot, even if he isn't able to verbalize it. Martins sees this, and Lime changes the subject again, imploring his friend to do right by this woman he clearly still loves. Lime realizes he's shown a vulnerability so he changes the subject. His heartburn, wishing he'd have had the forethought to ask Martins to bring some of the tablets that helped his condition from America. He's trying to humanize himself again. It's a brilliant tactic. It's difficult to kill or fight against a friend who is human and not some menacing faceless name. He's appealing to Martins friendship again. But Martins doesn't even blink an eye. Threats didn't work. Appealing to humanity didn't work. So now Lime tries to bribe him. Martins is having none of it, in fact, he tries to leave before even offering an answer. But Lime stops him, explaining that he doesn't need an answer right then. When Martins has it figured it out, then they can talk again. Then, on his way out, ending the situation on his terms and with the last word, Lime offers one more thought designed to appeal to Martins sense of justice for the benefit. "Don't be so gloomy. After all it's not that awful. Like the fella says, in Italy for 30 years under the Borgias they had warfare, terror, murder, and bloodshed, but they produced Michelangelo, Leonardo da Vinci, and the Renaissance. In Switzerland they had brotherly love - they had 500 years of democracy and peace, and what did that produce? The cuckoo clock. So long Holly." It just so happens that it also happens to be one of the best bits of a monologue ever written for a film, but it works so beautifully to cap off this scene. There's a lot to be learned from this scene. There's a lot of work being done in setting to help bolster the tension of the scene. There's dialogue that says so more in the subtext than the actual text. It has a character who is trying everything to convince his friend to do the right thing, or, at least, the right thing as he sees it. As a filmmaker, it's a beautifully constructed scene. As a writer, it's also a beautifully constructed scene. And would it have had half the power if it wasn't set on a Ferris wheel? Think about where your scenes are. Think about what your characters mean when they're saying things. Often, they can be saying things they aren't meaning, and it makes scenes that much better when you can do it right. I would also recommend watching The Third Man in its entirety. It's one of the best films and comes straight from the mind of a novelist. And the zither music score is incredible. Watch it. Study it. There's a lot to love. As for my writing, I started a new column at StarWars.com about the making of Star Wars called "Creating a Galaxy." The first installment is about tauntauns. I also wrote a piece about using dice to tell a story in Star Wars RPGS. You can read it at Fantasy Flight Games's website.